These Low-Carb Lemon Donuts with Cheesecake Frosting are the ultimate breakfast treat. These goodies are made with almond flour and coconut oil so they are packed with nutrition. The cheesecake frosting complements the moist, light donuts. 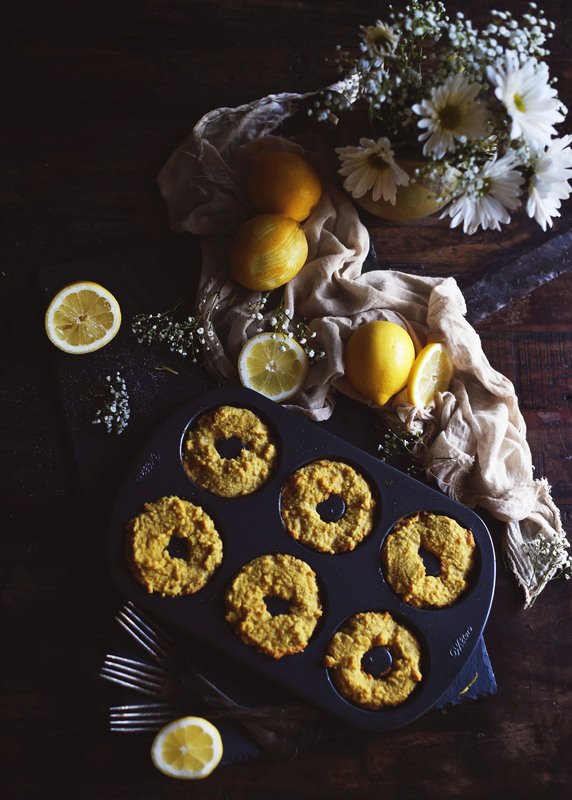 The donuts melt in your mouth and their lemony goodness will send you straight to citrus heaven. My donut pans have been getting a work-out recently! We regularly make our recipe for chocolate donuts. They have become a mainstay for road trip snacks as well as a quick and easy breakfast. While we love the chocolate donuts, we decided we needed a bit of a change-a donut with some citrus sass. Hence the birth of the lemon donut recipe. We named the frosting “cheesecake frosting” because the combination of lemon and cream cheese whipped together seems a little like frosting, but also a little like a light, fluffy cheesecake. Yum! 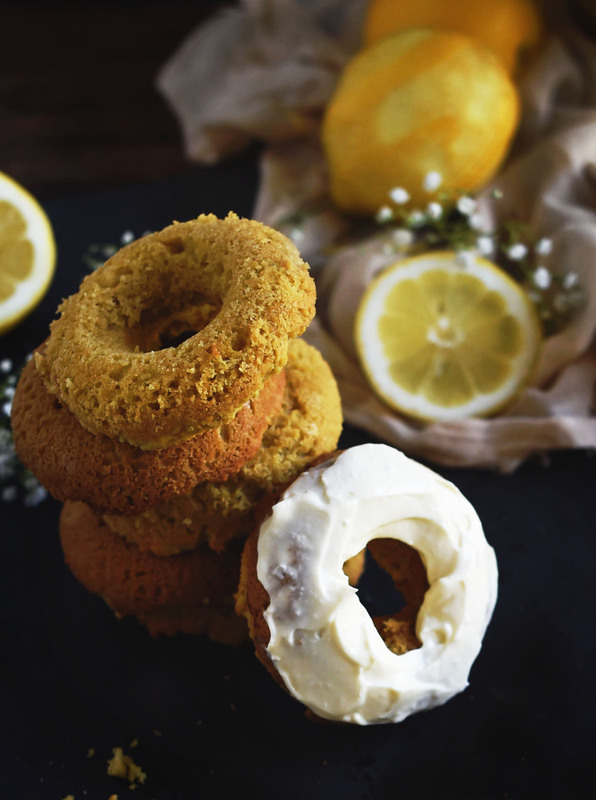 These Low-Carb Lemon Donuts with Cheesecake Frosting are made with almond flour so they are packed with nutrition and gluten and grain free. 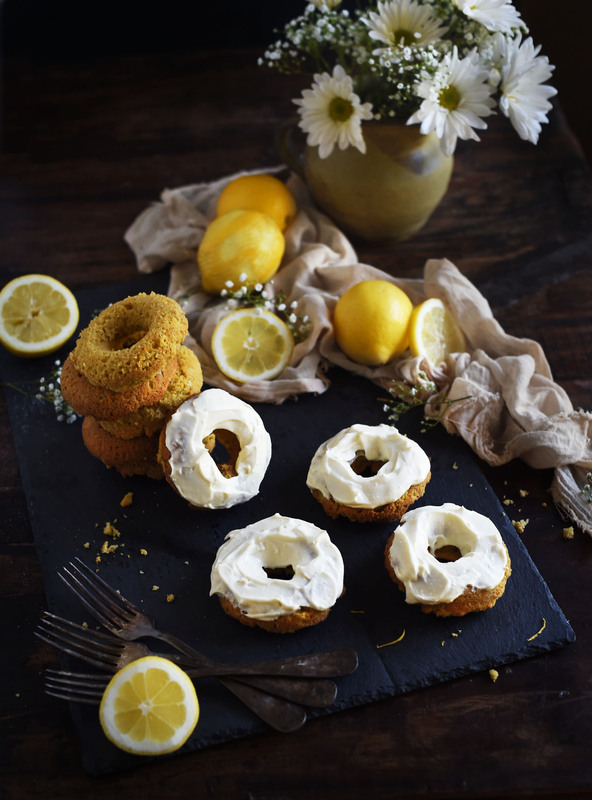 The lemon cheesecake frosting complements the moist, light donuts. Spray two donut pans (each with room for six donuts) with oil. Sift almond flour, sea salt, baking soda and sweetener into a medium bowl. Use a whisk to mix thoroughly. Add coconut oil to dry ingredients and stir until absorbed. Add the eggs, vanilla extract and milk. Spoon into prepared donut pans. Donuts are done when the top springs back when touched. Place pans on a cooling rack and allow to cool before frosting. Lavishly frost with cheesecake frosting. Using a mixer, beat together cream and granulated sweetener until smooth. Add vanilla extract and lemon juice and beat to combine. Add cream a tablespoon at a time and beat with a mixer between additions. Continue to add cream in this manner until the the frosting reaches the desired consistency. Pinned it just in case I start craving for sweets again. At least I won’t feel so guilty. These sound so delicious ! I love anything lemon!! I REALLY LOVE YOUR RECIPES!. I CAN NOT WAIT FOR THE NEW ONES!. Thanks so much! We currently put up two recipes a week. Right now our release schedule is every Tuesday and every Friday. We don’t have a certain time of day we make them public. It depends a little bit on what else we have going on that day. We may alter the schedule in the future depending on traffic. This recipe is AMAZING – I can’t wait to make them! Just curious what the macros for these are. How many carbs per serving? THANK YOU SO MUCH for this fabulous recipe!! We LOVE lemon and this is the ultimate lemon flavor in the icing! The icing could be a mousse….. I made the donuts (didn’t have so used muffin pans and worked out great) and then the icing. My heavy whipping cream had gone bad so used 1/2 & 1/2 – not thick enough. Made another batch of icing with the heavy whipping cream and they were perfect. This will definitely be a keeper. This comment makes my day! It’s why I do what I do! THIS LOOKS SO GOOD, I LOVE DONUTS. I put them in a container with a cover and keep them in the refrigerator.